All wetted parts are constructed of 17-4 PH SS or Inconel® for ranges 15 psi up to 6000 psi (1 bar up to 400 bar). 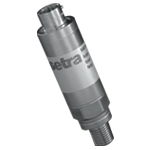 (Pressure transducers ordered in 600 or 690 bar and 10,000 psi ranges are only available with Inconel wetted parts.) Specify Model 540 when ordering a pressure transducer with stainless steel wetted parts, and Model 542 with Inconel®. Models 540/542 are offered with choice of 10-6-Pin Bayonet Connector, Weatherproof Cable, and Molded Submersible Cable (submersible up to 656ft.) for electrical termination. Depending upon the electrical connection selected, when coupled with the Model 540/542 enclosure, which is fabricated in 321 SS, this unit is rated for IP40, IP65, IP66 or IP68 operation. Requiring vitually no maintenance, the stability of this unit assures the user of high reliability, with less than 0.06% drift per year. Principles of Operation: Thin Film Strain Gauge Pressure Sensors. Using the well proven Wheatstone Bridge principle, molecular layers are sputtered onto a 17-4 PH stainless steel sensing element, providing excellent resistor definition and uniformity. Sputtered thin film technology allows the design of simple, highly accurate and compact strain gauges. This method virtually eliminates drift, while offering enhanced sensitivity.